A casual visitor standing on the eighteenth century bridge spanning the River Ceidiog could not fail to notice a high Street with its many white washed cottages and a Parish Church with its tall spire overlooking them all. The Parish Church (Church in Wales) restored in 1877, is on the site of much earlier churches as the reputed 900 year old yew tree in the circular churchyard testifies. One hundred or more years ago the village was a much busier place than it is now. To meet the needs of a population of 700 there were at least 2 bakers, 5 grocers and general dealers, along with smiths, wheelwrights, joiners and tinmen. There was also a resident policeman. The contrast with today is quite startling - just one general shop and a Post Office. The police now serve a much wider area. There was also an abundance of taverns open mainly to serve the needs of farmers and dealers attending the fairs held on February 25th, May 3rd, July 5th, August 28th and November 14th. Their names were - Blue Bell, Kings Arms, Cross Foxes, Cross Keys, Butchers Arms, Ty'n y groes, Ty Newydd and the Blue Lion - subsequently named the Dudley Arms - now the sole survivor of them all. The fairs were held in the High Street and in a field below the church at Tan y fyniant. They ceased to be held about 1910 but, from time to time, the late Mr. R.J. Clack, the owner of the field, used to unearth clay tobacco pipes thrown away at the fair. The house now called Porth Pennant was the former Cross Foxes and, until recent times, an attachment for weighing wool could be seen on the North side. Opposite, at Bronllan, can be seen the outline of pig pens. 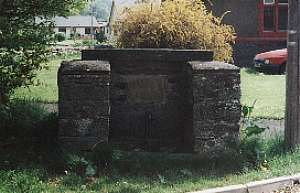 One can imagine the insanitary conditions caused by so many animals and people around the village at fair and other times but there was an adequate water supply at five points in the village gifted by the Reverend John Wynne (Vicar 1825-1870) in 1887 the year of Queen Victoria's Diamond Jubilee. A trough inscribed 'V.R. 1887' is still in place by the Canolfan. The Iron Bridge over the River Ceidiog is of the same date, though much repaired, and is very convenient for present day walkers. The other places of worship in the village are Capel Herman (Presbyterian Church of Wales) opened in 1881. Previously worshippers attended Capel y Rhos or Salem opened in 1822. This former chapel is now known as Penrhos and Maesteg. A school was held in Capel y Rhos prior to the opening of the present school in 1847. This school was remodelled in 1962 and has upwards of 50 pupils. Along with a resident Headteacher and Staff from the locality it preserves a vital ingredient in the life of the village. On the Corwen road there is the finely pointed Capel Hananeel (Annibynwyr Congregational) dating from 1827, improved upon in 1850 and a vestry dating from 1928 Capel Seion (Wesleyan Methodist) in Berwyn Street has been skillfully converted into a private house. It dates from 1804 and was enlarged in 1884. During the last 50 years or so, Council estates have been built at Rhoslan, Bro Dinam and Rhos Helyg and, more recently, the attractive Llys-y-Coed estate by Cymdeithas Tai Clwyd. There are private developments at Bro Helyg and Cae Maes Hir. Despite linguistic and social mobility changes, the village still preserves a strong cultural tradition - witness the activities of Merched y Wawr, Cymdeithas Ddiwilliadol, Clwb Camen, Clwb Ceidiog to name but a few.